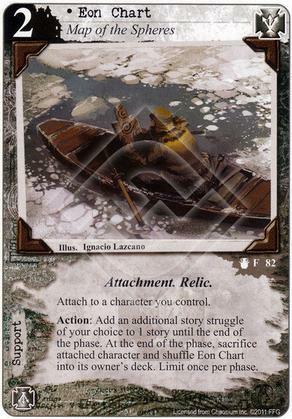 If this is attached to Claret Knight, am I correct that triggering this would give the additional struggle, and Eon Chart would shuffle into my deck, but the Claret Knight would not be sacrificed? Would this one fall under the 'creates a lasting effect' so it wouldn't protect Claret Knight? This is a very good question, and a little tricky, the triggered effect that resolves, is not resolving on The Claret Knight, it resolves "on the game state” as it were. Once that triggered effect has resolved it creates two constant effects, adding an additional struggle to the story and discard attached character. When the sacrifice effect resolves at the end of the phase it is no longer the triggered effect but the altered game state which is resolving, which The Claret Knight cannot ignore. "Action: Add an additional story struggle of your choice to 1 story until the end of the phase. Limit once per phase. Forced Response: At the end of the phase which Eon Chart has added a story struggle, sacrifice attached character and shuffle Eon Chart into its owner's deck." So, yes it would sacrifice Claret Knight. You were correct TwoShedsJackson that the lasting effect would get rid of him.